I've been gaming ever since I was born. I can talk endlessly about video games...but what do they say about me? Is my passion a positive one...or does it encourage my bad habits? I'm on a journey to explore my relationship with games and discover how I can become a better gamer mentally, physically, and spiritually. I want to share what I learn along the way with those who also want to become better gamers; in the real and virtual world. Press Start to Join! Nintendo recently announced Majora's Mask is coming to the 3DS. Everyone who played the Ocarina of Time 3D had been wondering when this announcement was going to happen. It doesn't seem we have to wait too long to get our hands on it either, with an expected release date some time in the Spring of 2015. This remake looks fantastic and I can't wait to play it. 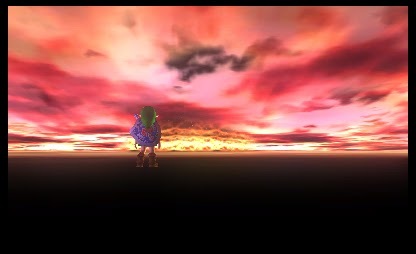 Confession time: I've never played Majora's Mask. I know! All the time I spent playing Ocarina of Time over and over again I could have been playing Majora's Mask. It's one of the many Zelda titles I've never played, even though I claim to be a huge fan of the series. How come I never played Majora's Mask? I was probably too busy still playing Virtual Pro Wrestling 2 which was released January of that year, and saving up my money for WWF No Mercy, which came out a month after Majora's Mask. For the longest time Majora's Mask was on my wish list of Nintendo 64 games. I had a great library of N64 games growing up, but I missed a few big ones like Majora's Mask. Over the years I sold, bought, and sold again my N64 collection. In the past year I've slowly tried to re-build, and I'm getting closer to restoring my N64 library similar to it's glory days. What makes a game better than the rest?